When I walked by the mirror, I did a double take! Typically seeing myself in the mirror added an instant 10-15 lbs, especially since it felt like I had done nothing but watch the scale move upward the past few months, but this time it looked like I had lost 10 lbs! I instantly snapped into good posture: threw my shoulders back, stood up straighter, lifted my head, did a little pelvic tilt and felt more confident. WHAT just happened? I felt 10 years younger. No, seriously. I felt like I did 10 years ago-confident, content with myself physically, eager to interact and engage with people, and healthy. Do not misunderstand me here, I don’t necessarily want to go back to being 10 years younger. The old me was not so self-aware, didn’t understand the depths of God’s grace, and was immature and inexperienced. I am grateful for the joy-filled highs and lows I have lived in the past decade, but the reality is, when I caught a glimpse of myself the way I want to feel, I instantly channeled that feeling. There was no doubting, no questioning, no anxiety or wondering if I was doing it right. 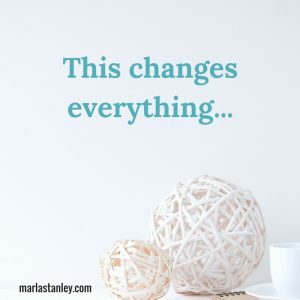 I saw who I was supposed to be-a confident woman in Christ, capable of whatever God had set before her, and ready to leap head-long into the adventure He had planned. Everything shifted in that moment. When I see my identity clearly, I trust Him without overwhelm. How I see myself changes everything. This identity in Christ, and this identity in this fallen world, are so crucial to living victoriously each day. How you see yourself changes everything. Are you downtrodden, defeated, desperate? Are you righteous, joy-filled, forgiven, and holy? Because no matter how you feel, if you are His child, Your Father says you are all those things, RIGHT now. If you are feeling stuck, overwhelmed, angry, stressed, anxious, and depressed, living in the fullness of your identity in Christ brings freedom!